A richly decorated, silver-mounted, English fowling piece influenced by the work of John Harman. 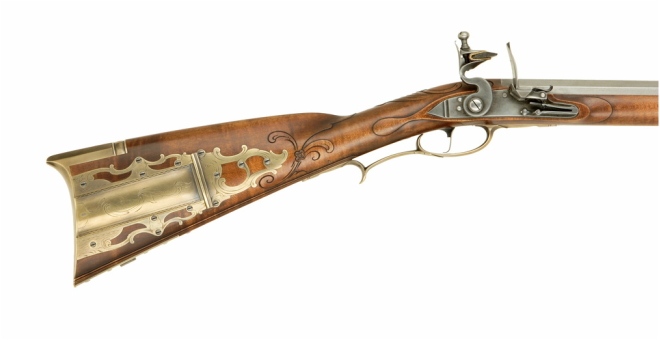 This gun is representative of first class London work form the 1760's. A custom made lock was created for this project as was the relief sculpted silver mounts. Significant amounts of silver wire inlay add to the beauty of the piece. A unique pear stocked take down rifle. 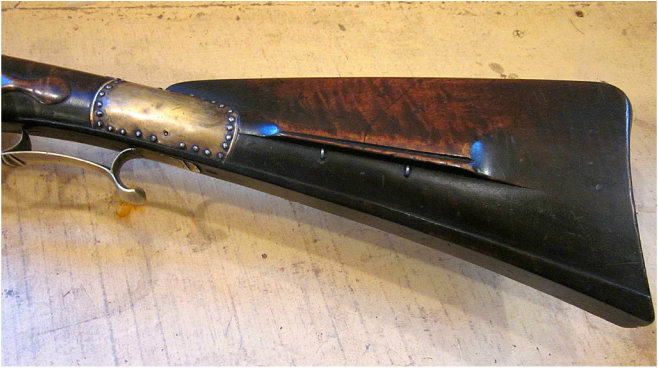 This gun has strong fowling piece influence in the stocking and hardware used. Design elements used creates a very smooth and flowing piece. 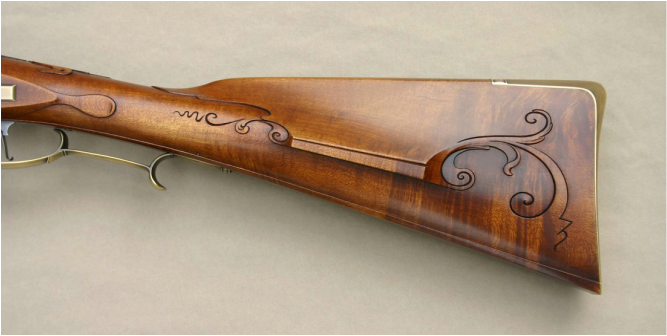 Wood used in this rifle was from a tree planted by Wallace Gusler, which subsequently blew down in a hurricane which struck Williamsburg. A very graceful gun. A very smooth and graceful rifle by Jim. 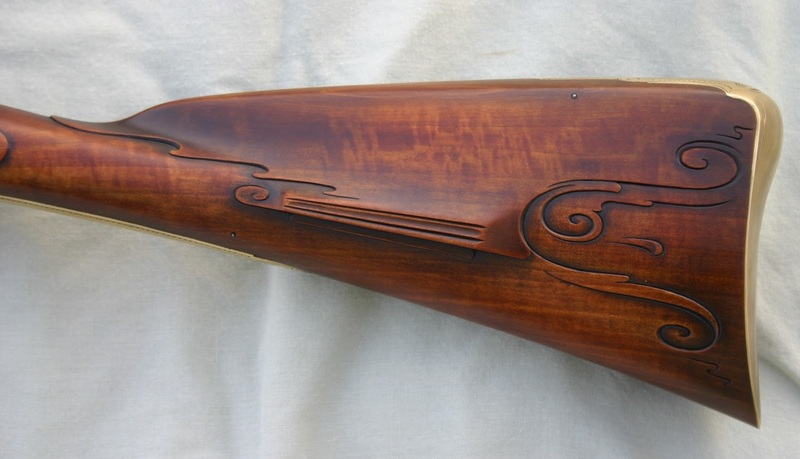 Somewhat stylized decoration is used in a conservative manner to create an inviting and warm rifle. A sleek and flowing rifle. 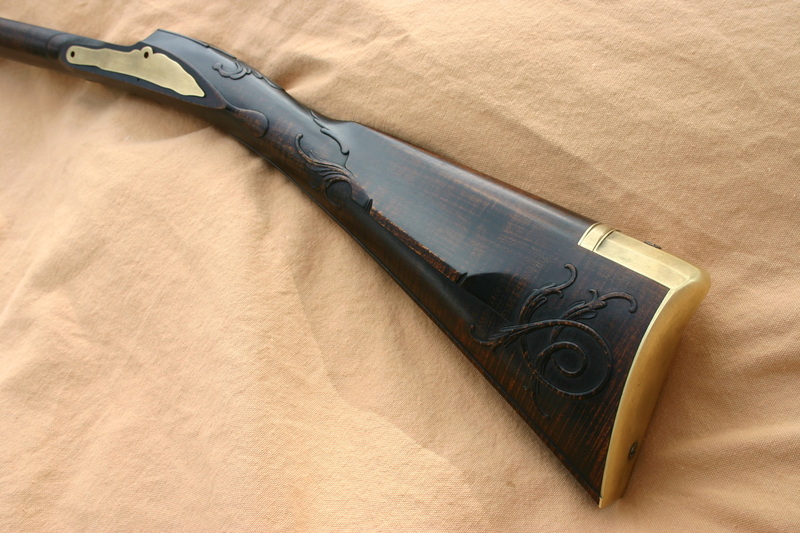 A highly decorated and stylized rifle by Jim. Many design elements taken from the work of the late John Bivins as well as published French designs. 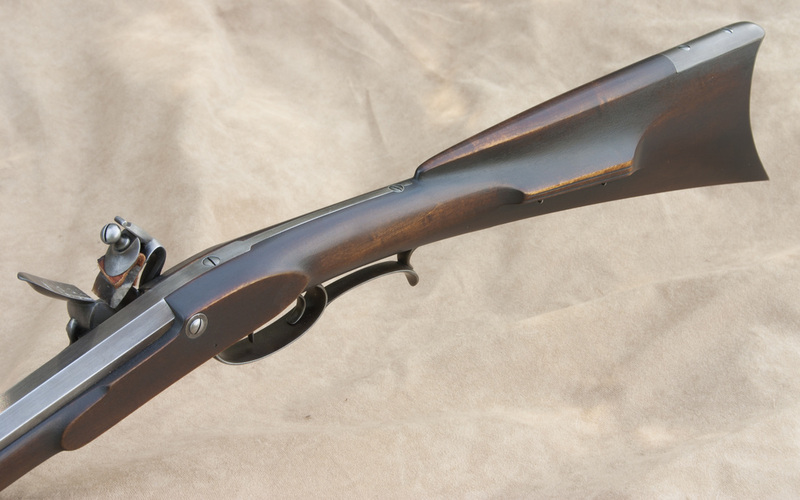 A relatively sophisticated rifle that still maintains harmonious continuity throughout. 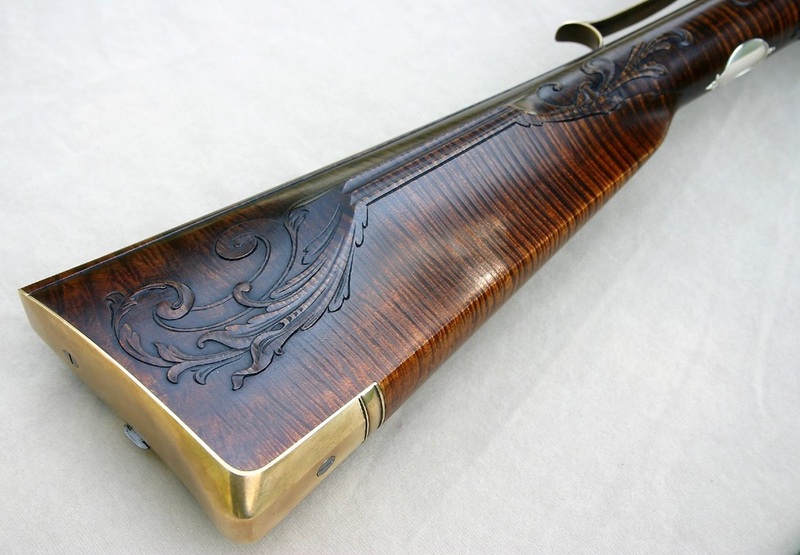 A "golden age" rifle in the style of work by George Eister. A rifle in the "new school" style as developed by John Bivins. 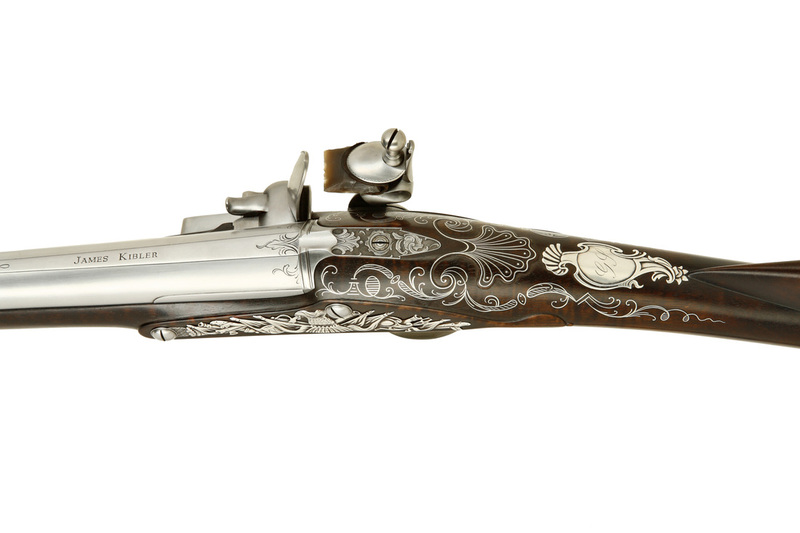 A beautiful highly stylized rifle with a graceful appearance. A relatively plain piece of wood was chosen to accentuate the forms and designs used. A relatively early rifle with some John Newcomer influences. Rifle contains some unique and interesting stylized details. Another rifle from early in Jim's gun building career. 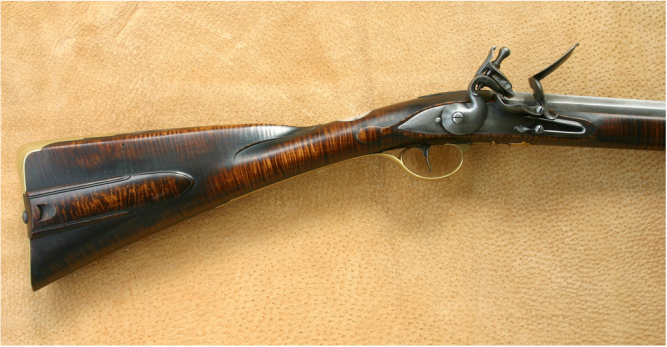 A documentary copy of an original rifle attributed to George Shroyer. 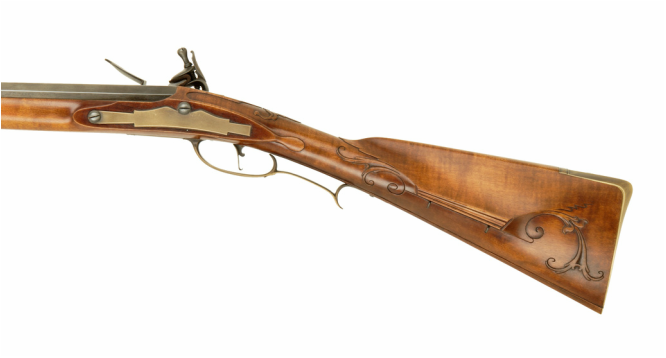 This original is commonly referred to as the "Bowers" rifle and is shown in Rifles of Colonial America (#92), by George Shumway. 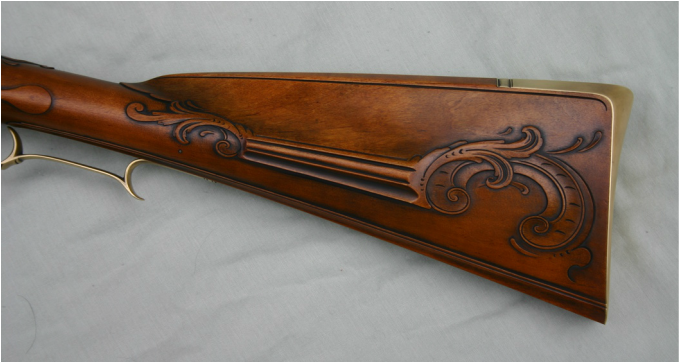 This rifle is believed to have been made very early in Shroyer's career and contains many stylistic details of a rifle from the 1760's. A relatively restrained rifle with strong fowling piece influences. Somewhat reminiscent of the work of John Newcomer. A very fine piece of maple was chosen for this project. Rifle in the style of work by George Shroyer. Somewhat restrained decoration fitting for a Revolutionary war period firearm. A rifle built early in Jim's career. 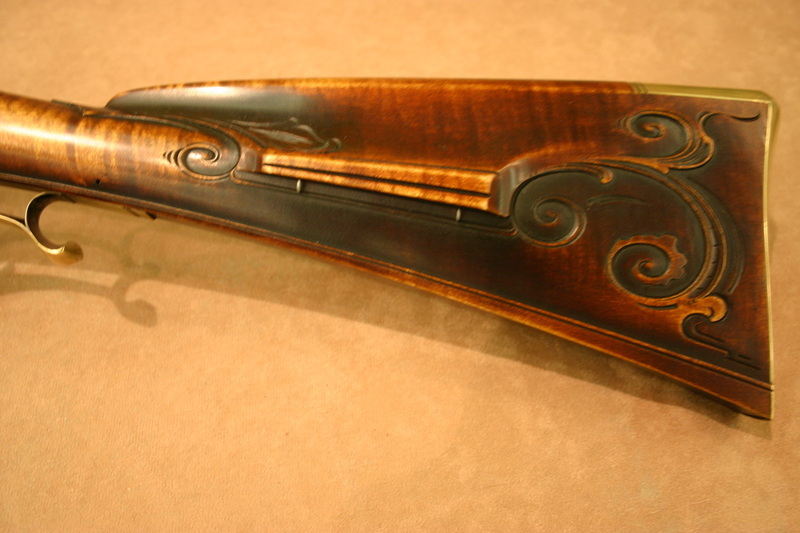 A strongly carved longrifle by Jim. Some carving elements derived from Belgian work from the first half of the 18th century. A rich and beautiful rifle. 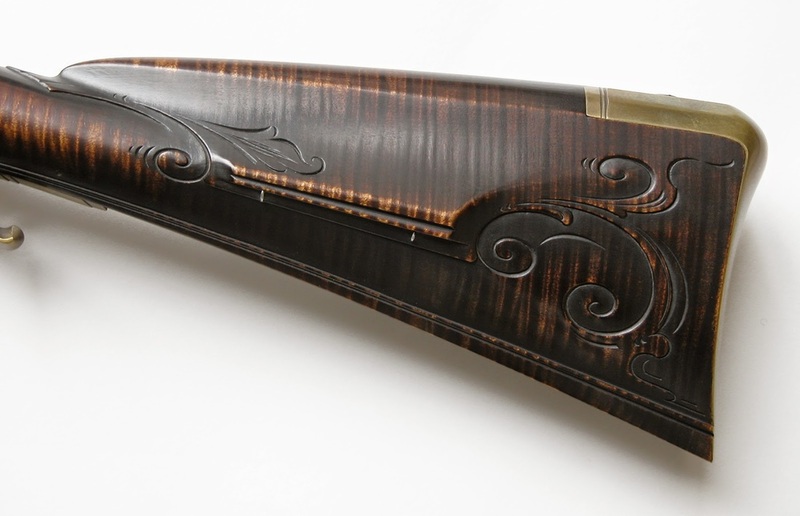 Contemporary styled rifle featuring sleek architecture flowing carving and bold finishing. Southern Mountain Rifle in plain maple with a dark finish made from one of Jim's kits. 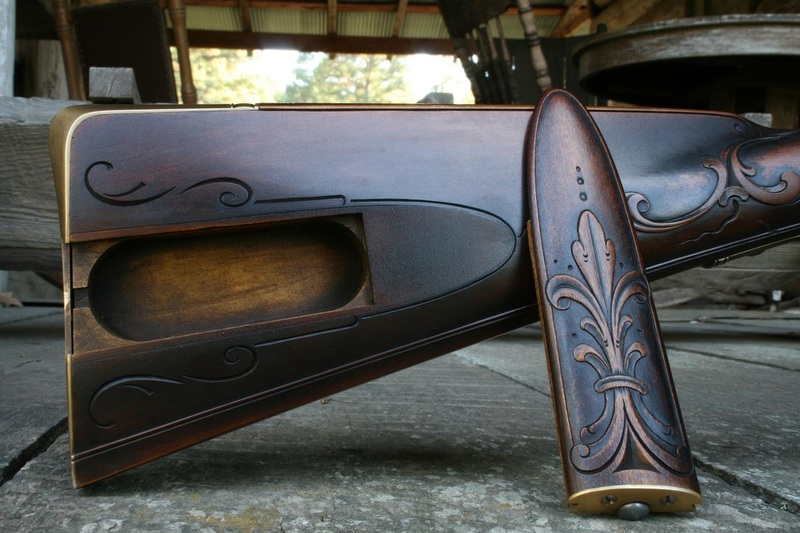 Colonial Rifle Kit in fancy walnut carved and finished by Jim.